There is no roller furling headsail on Serenity. I have seen so many problems and failures with various systems, that I don't trust them. When everything is working, they sure are convenient, but when they fail, it is usually at the worst possible time, like in a storm, or sailing solo. 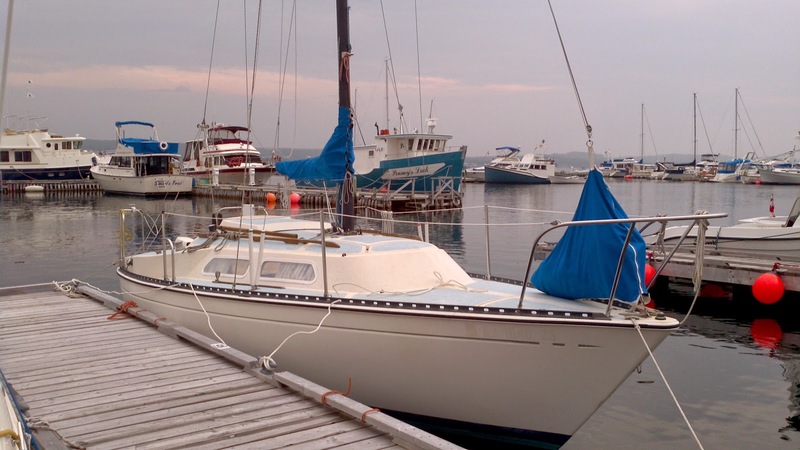 Two or three years ago we had a cruising couple from another country detour into our marina, and spend two weeks waiting for parts and repair, after their furling system was damaged in a storm. That was a scary situation for them when it happened, plus a big chunk out of their limited boating schedule used up for the season. A very experienced and cautious sailor I know, almost 80 years old at the time, had to fight to manually wrap the jib when his furling failed. He was lucky to have someone to hold the tiller, since he often sailed alone. A buddy of mine bought his first sailboat last summer. He couldn't use his jib for a few weeks while we tried various solutions to get his furling working. We finally determined it was missing a part from the previous owner that we couldn't buy locally or find online. It had to be made up, and the halyard run differently. Helping attach the repaired furling on the French boat. Another problem with a roller furled sail is the shape. As the area is reduced, the sail shape becomes less and less ideal. On the other hand, you are probably reefing because it is getting windy, and a perfect sail is less and less important. Unless you really need an extra 1/4 knot for safety reasons, an ugly sail is not the end of the world. As I stated above, Serenity has no roller furling. That means I have to carry a selection of sails. My main working jib has a reef point, so it can stay hanked on for a broad range of conditions. I also have a smaller and heftier storm jib, should I not be able to make a safe harbour in time. For light wind conditions, there is a fairly large genoa. These two sails were gifts. The boat came with a jib that does not really fit the boat, and I only keep it as a spare. This means 3 bulky sails taking up a lot of space on <23' boat. Furling would certainly cut down on the clutter. Serenity's sail deck bag with working jib always ready to go. So, what if I did want to put a furler on Serenity? 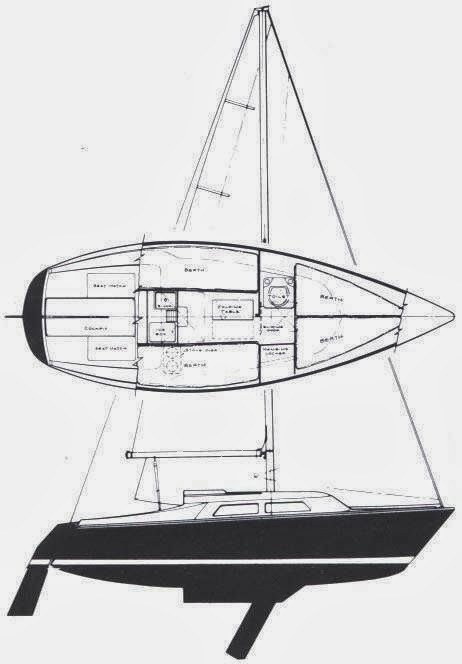 My main issue, as primarily just a weekend cruiser, is not the bad sail shape, but the chance of failure. Almost every case where someone has had a problem with their furling, it has been to do with the jib halyard in one way or another. There is a Canadian company making a furling system with the halyard integral to the foil. This pretty much eliminates the wrapping and jamming a normal halyard setup can create. The Simplicity headsail furling system. See item #4. There are two boats I know of at the Lewisporte marina with this system, and the owners have had no problems with them. Should the time come when I need to replace the working jib, or sail storage becomes too much of an issue, it is possible that Serenity could end up with this solution, or one similar. In the meantime, I'll keep hanking them on, and feeling safer doing so. Thanks for reading the blog and your comment. Serenity has been neglected this year while I concentrate on building a new shed/garage/workshop (http://jph4.blogspot.ca/2015/11/the-new-shed-phase-9.html). It was put in the water early this season, but that was mainly to get it out of the driveway where it was blocking access to the construction site. Hope to get some sailing in before the season is over, and of course, there is a long list of projects I have to get to. I'm still working on filling in the gaps in the blog timeline too, like the current draft of how I upgraded the engine mount a couple of years ago. There will be more content eventually.